A frequent lament among western theater readers is the lack of a good modern history of the 1863-64 East Tennessee Campaign(s). I am not aware of any new projects in the works, but there are a few good pieces here and there. In terms of book length studies, Ambrose Burnside's advance from Kentucky into East Tennessee that resulted in the capture of Knoxville has been completely neglected [ed. 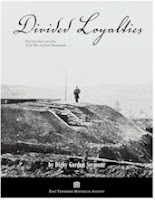 although Earl Hess has mentioned that he is working on a Knoxville book], while a pair of books cover Longstreet's campaign to recapture the city -- Digby Gordon Seymour's oft reprinted Divided Loyalties: Fort Sanders and the Civil War in East Tennessee [again, even though I have it pictured at left, I don't recommend the 3rd edition - see link for explanation] and Alexander Mendoza's more recent Confederate Struggle For Command: General James Longstreet and the First Corps in the West. Mixed bags in terms of detail, neither provides more than a general overview of select events. 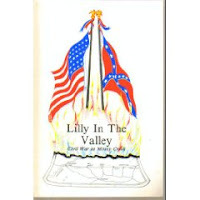 The product of research into published sources as well as his own amateur archaeological studies, David C. "Cleve" Smith has published two very worthwhile books: Lilly in the Valley: Civil War at Mossy Creek (Author, 1986) and its full length expansion titled Campaign to Nowhere: The Results of General Longstreet's Move into Upper East Tennessee (Author - Strawberry Plains Press, 1999). 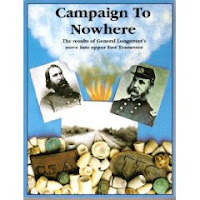 If you can find a copy at a reasonable price, Campaign to Nowhere is a recommended acquisition. The text is heavily drawn from the O.R. and is supplemented by numerous photographs and maps, the latter being detailed hand-drawn terrain and troop movement renderings that are worth having on their own. Another local history documents a pair of military events that occurred before (Oct. 10, 1863) and long after (Aug. 23, 1864) Longstreet's Knoxville "siege". Like Smith's Campaign to Nowhere, Blue Springs: A History of the Desperate Battles at Blue Springs for the Control of Upper East Tennessee During the Civil War by William A. Beard III (Town of Mosheim, 1997)* includes a lot of maps and photographs, as well as an archaeological discussion. I plan on posting a review of this book. Drew, Since you mentioned it . . .
Chattanooga/Knoxville is slated as our fourth volume in the Savas Beatie Military Atlas Series. No date has been set for release. There are several other volumes now underway as well, including a trans-Mississippi series. Booknotes - "Tinclads in the Civil War"